Created by Red Room Poetry, City of Sydney and Strategic Community Assistance to Refugee Families (SCARF), the Fireflies Program supports employment pathways for people with refugee backgrounds. It supports them to present early literacy programs in organisations like public libraries and early childhood educational institutions. The Fireflies celebrate the idea that uniqueness comes from what we carry on the inside. Made of newly arrived people, they’ve each worked with a professional storyteller to develop their content and presentation. The project supported the community by providing professional development to people of refugee backgrounds in language and in English to create the Fireflies. 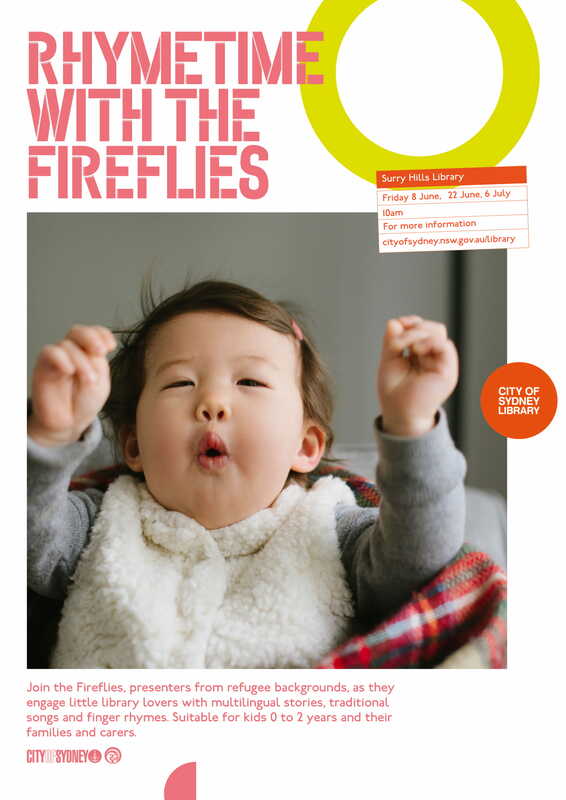 The Fireflies engaged little library lovers with multilingual stories, traditional songs and finger rhymes. Rhymetime presenters from Myanmar will teach stories, traditional songs and finger rhymes in our new fortnightly rhymetime sessions. The sessions are designed for babies and toddlers up to 2 years and their families or carers. Learn words and phrases in Kareni, explore your curiosity and connect with diverse cultures.